← Art Supplies DO grow on trees! Wow…it’s been a busy time trying to get back on schedule after Spring Break. It seems I have more trouble every year getting it back together…need a permanent vacation I think. So first things first…GOT LACE????? I do 🙂 I had ordered a bunch from my good friends Barrie and Carol at Scrapadabadoo. You need to get some. I have been just looking at it and looking at it. GORGEOUS! And no, I am not going to share mine so don’t even ask. You just have to go over and order your own. They are carrying a lot of good stuff at Scrapadabadoo…be on the lookout for the new Punky Sprouts chip albums coming soon…I adore these and can’t wait to get my hands on one! They are also have a RAK over at the blog. 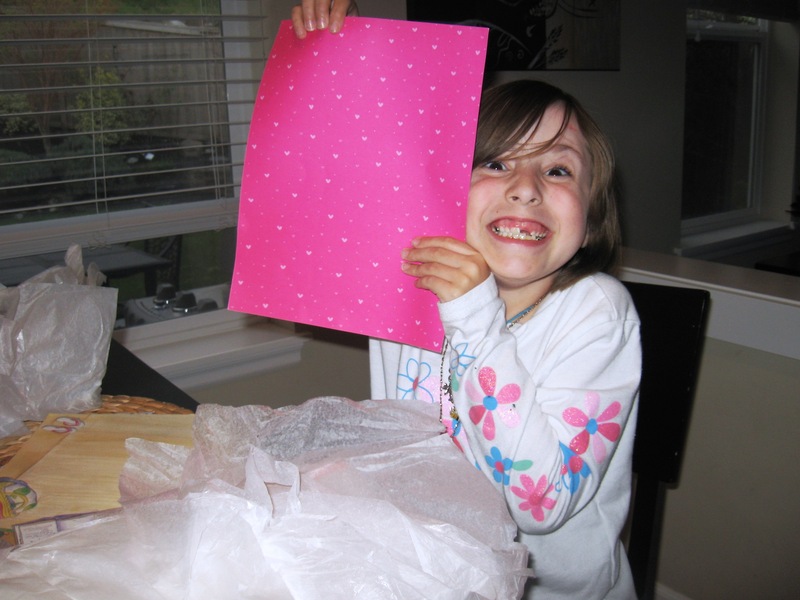 All you need to do is download a super easy template for a paper box and post your creation to their site. Here’s mine! I am usually all thumbs when it comes to templates…I am not as orderly as I should be and tend to just cut and fold whereever…but even I couldn’t mess this one up! I used some pretty Prima paper and crackled it for a different finish. It also helped stiffen up the box a bit. I added some feather, Prima flowers and pearls. And to finish it off some of that beautiful lace…I almost hated to use it. What a great little gift for someone. So any takers??? First one to do the blog challenge and post a comment linking it back here will get this box! 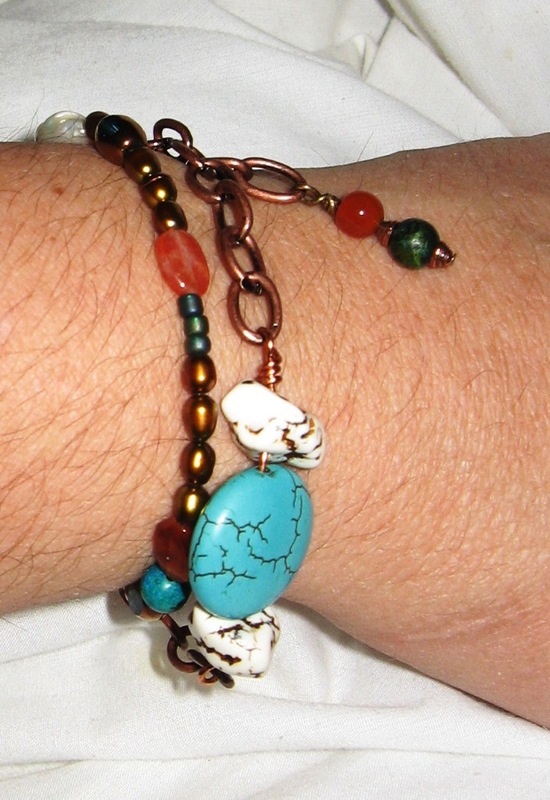 Last but not least you need to go over to Impress 2 Bless my friend Aimee’s new Etsy shop. She is a fabulously talented mixed media artist who I was honored to work with over at Project 52. This is her new venture and all the proceeds from her jewelry allow her to help out people in need of a little extra. What a great idea. I wish her tons of success with this and was lucky enough to get this gorgeous bracelet before anyone else snapped it up! Wow you did great on the box ! I may have to make another one so you will send that one to me!! LOL… ok I will wait and let someone else have it! Thanks for the praise and we are so glad you like your lace. Be on the look out for our new Prima Lace pack to be added soon ! And ohhh, I love what you did with the box!!! I work waaay too slow to have a chance at winning it, but I’m going to make one anyway! Love that crackle effect!!! I just HAVE to find room in my budget for that lace – too gorgeous to pass up! Love the bracelet Leslie! I checked out Aimee’s Etsy-she does such lovely pieces!! Your box is sooooo beautiful! I love the crackle!! 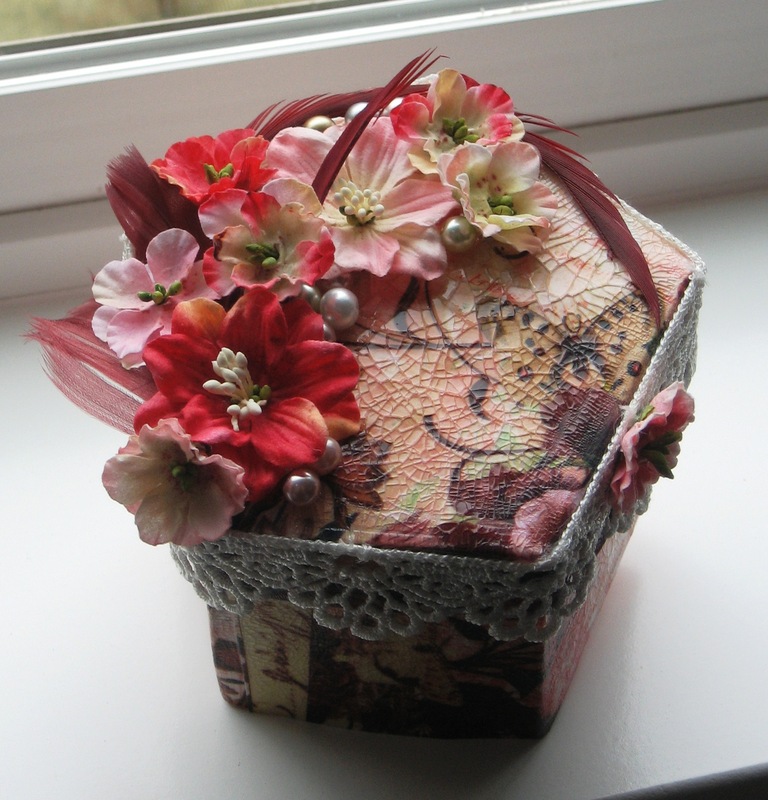 Love how you used the feathers and pearls… did I mention how talented you are and how gorgeous this box is!! You rock Lady L! !